Aerial photovoltaic thermal imaging surveys in accordance with IEC 62446-3:2017 and BS EN ISO 62446-1:2016. 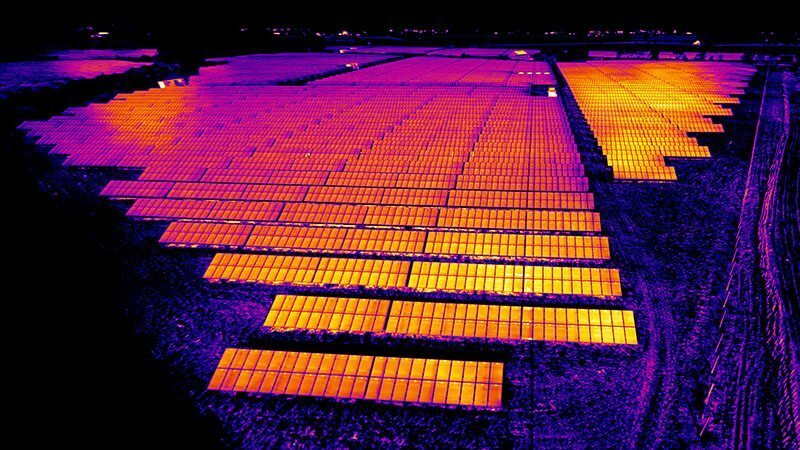 Our aerial thermal imaging surveys can detect and accurately locate faulty cells, string-errors, organic debris, defective diodes and PID faults on solar farm installations. Our drones conduct technical inspections using specialist, purpose-built thermal imaging cameras that are an ideal solution for identifying thermal anomalies and maximising energy production. Faulty cells operate at a temperature (hot or cold) different to that of normal cells, meaning we can easily pin-point the location of cell faults either by GPS – referenced to a site map – or by using graphical overlays. Thermal imaging cameras are capable of detecting minor temperature differences caused by stray currents in crystalline photovoltaic modules (known as potential induced performance degradation or PID) aswell as the early detection of defective diodes. iRed has ‘Permissions for Commercial Operations’ (PfCO) from the Civil Aviation Authority (id No. 2082) to operate unmanned aerial vehicles (drones) commercially. Faulty cells operate at a temperature different to that of normal cells, making them easy to detect with infrared technologies. 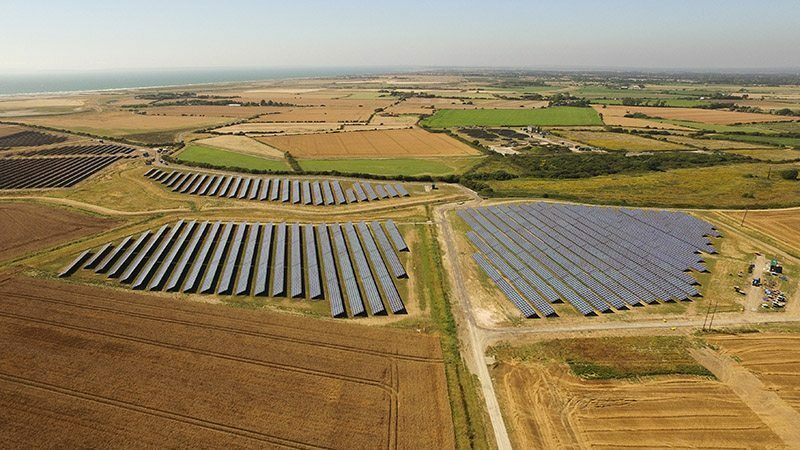 Accurately locate costly string errors – found on solar farms using string inverters – that could otherwise affect the performance of entire rows. Thermal imaging allows for the early detection of defective diodes, reducing potential voltage loss through photovoltaic modules. 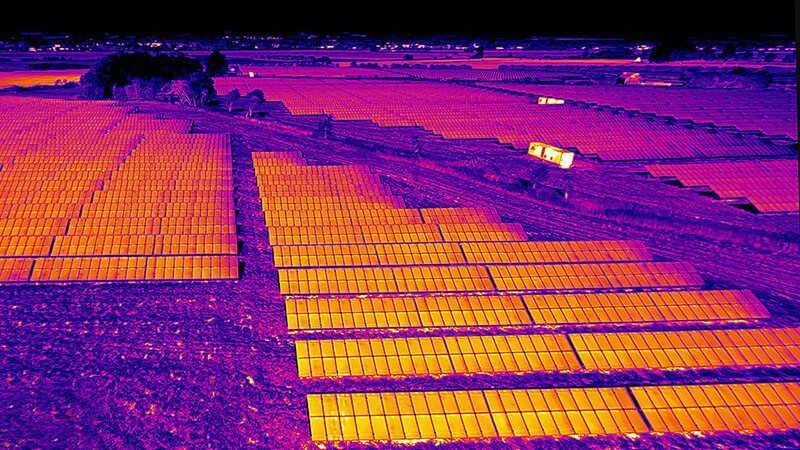 Thermal imaging cameras give reliable, actionable data for effectively assessing the efficiency of solar farm installations. Detect and locate organic debris and flammable materials that could otherwise cause risks to equipment and the environment. Infrared cameras can detect minor temperature differences caused by stray currents in crystalline photovoltaic modules (PID faults). During an infrared solar survey, our engineers use irradience meters to measure panels before inspection. This allows us to ensure that panels are operating at an optimum temperature for the detection of faults and issues. Our engineers hold PCN Category 2 & 3 thermal imaging qualifications – accredited by the British Institute of Non-Destructive Testing – which meet the requirements for undertaking infrared solar farm surveys to IEC 62446-3:2017: Non-Destructive Testing – Outdoor Infrared Thermography of Photovoltaic Modules and Plants and BS EN ISO 62446-1:2016 standards. iRed operates a Quality Management System in accordance with BS EN ISO 9001:2015, demonstrating our commitment to service quality. In addition to this, we’re a CHAS accredited organisation, registered Constructionline supplier and proud members of the Association of Remotely Piloted Aircraft Systems in the UK (ARPAS). Click here to find out more. Operating at a height of 80 metres provides a quick and efficient overview of a photovoltaic site, allowing for the swift identification of significant thermal anomalies. Due to the height of these solar surveys, individual fault analysis cannot be conducted and temperature values will not be collected. Operating at a height of 30 metres enables our infrared cameras to capture faults and anomalies at a much greater resolution, allowing for the individual identification of faults. Conducting a solar survey at 30 metres complies with ISO BS EN 62446-3:2016, and allows for accurate temperature values to be collected and analyzed from the captured radiometric data. Ground-based thermal imaging surveys enable us to use advanced infrared cameras, providing greater control over settings and improving the quality of captured data. This increased resolution allows for detailed fault analysis, and as such complies with the requirements set out in BS EN ISO 62446-3. Inspecting photovoltaic panels from the ground enables surveys to be conducted with lower immitance levels, and provides a close-up view of the elements on the underside of a panel such as module boxes, wiring, joints and combiner boxes. Inspecting the underside of panels also means that surveys can be conducted without the adverse effects of solar reflection. Ground-based surveys are often use in conjunction with an 80 metre aerial overview survey.